Donations welcome and enable this special visit of Nawang Khechog to Louisville! Thanks! At the age of 13 Nawang Khechog was ordained as Tibetan Buddhist monk and later he became a kugyer tszaam-pa or Hermit Meditator who was personally sponsored by His Holiness the Dalai Lama. Nawang also received guidance and advice from His Holiness during his four years as a hermit meditator. Living and teaching in the West for the last 20 years, Nawang has developed an accessible and relevant way of teaching the essence of ancient Buddhist teachings to the modern mind and way of life. He draws most of his inspiration from the Buddhist teachings he received from His Holiness the Dalai Lama over 30 years as well as from his teachers and other lamas. This presentation will share how to cultivate universal compassion and infinite love for all beings, how to realize the interdependent nature of all realities, the Four Noble Truths, the transitory nature of life, Buddha nature and infinite human potentials, how to transcend and overcome anger, jealousy, attachment and emotional sufferings. The workshop will also include meditation practice, love and compassion walking meditation, universal dance of compassion, Tong-Len practice, a practice of universal love and compassion by taking in all the suffering of all beings and giving out all the happiness and merits. He knows this latter practice well, having used it for pain management after a deadly car accident in 2007 in India, left him with critical injuries and massive pain that could not be treated with Western pain killers due to his fragile condition. This event is FREE, but registration is requested. Donations are appreciated. Please register at DrepungGomangUSA.org under the Compassion Center Classes tab, by emailing DrepungGomangCompassion@gmail.com or calling 502-614-5616. NAWANG KHECHOG was a Buddhist monk for 11 years, including four years as a hermit meditator in the Himalayan foothills personally guided by His Holiness the Dalai Lama. 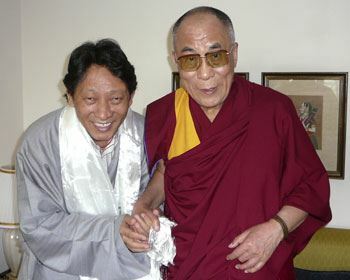 He has studied Buddhist philosophy and meditation with His Holiness the Dalai Lama, as well as many other Tibetan masters. For these reasons, he fills a unique spot in Buddhist culture as a teacher, performer, practitioner, and Tibetan freedom fighter, as well as being a Grammy-nominated musician. Having spent more than thirty years in India as a Tibetan refugee, Nawang now lives Colorado and continues sharing the values of universal kindness and compassion in workshops across the country. He is the author of Awakening Kindness: Finding Joy Through Compassion with Others and has given Buddhist Workshops since 1989. On Sunday, April 23, 7-9:30pm, Nawang will be a featured musician at the Tibetan Freedom Concert at the Kentucky Center for the Arts. Tickets available for $28 and $38 at www.KentuckyCenter.org.